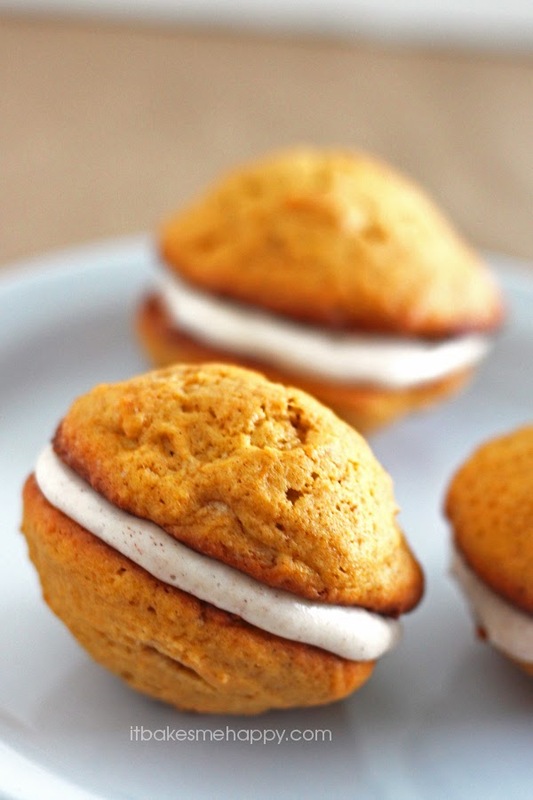 Soft, cakey Pumpkin Whoopie Pies are sandwiched with a cinnamon cream cheese frosting. Pumpkin and cream cheese, two things I would not have eaten as a child. Oh boy how time changes our tastes and the foods we once cringed away from! Admittedly, I’m not big on cream cheese, maybe it’s the tanginess or maybe it’s the texture? But if you mix in enough sweet, I can’t seem to get enough of it. When I saw this month’s ingredients for the dessert challenge, I wasn’t quite sure if I wanted to bake or not. I decided to take it literally as a challenge and make these two ingredients into something I could love. I’ve seen dozens of whoopie pie recipes online over the last couple of years and I had never even once attempted to make them. No time like the present, so I went for it and you know what? I’m glad I did. They turned out to be cakey, delicious pumpkin cookies sandwiched with a cinnamon cream cheese frosting. I hope you’ll enjoy these Pumpkin Whoopie Pies as much as we did, happy baking! Preheat your oven to 375º and line a baking sheet with parchment paper. In the bowl if your stand mixer beat the butter and sugars until fluffy. Add the egg, pumpkin and vanilla and mix well. In a mixing bowl combine the flour, baking powder, cinnamon and salt. On low speed mix the dry ingredients into the wet until the dough just comes together. Scoop the dough into 2 Tbs rounds and bake for 12-15 minutes until the tops spring back and the edges are lightly browned. Remove from the oven and cool completely on a wire rack. In the bowl of your stand mixer beat the cream cheese and butter until pale, add the vanilla, cinnamon and milk and mix. Add the powdered sugar at low speed and mix until smooth. Pipe the frosting in a circular motion onto the flat side of a cookie and top with a second cookie. Chill in the refrigerator for 20-30 minutes and serve.